Three tails. Dark gray wings with medium greenish or brownish olive body. 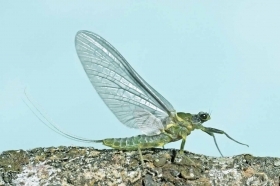 This mayfly is a very close cousin to the Green Drake. Late June through July. Duns usually emerge in the late afternoon. 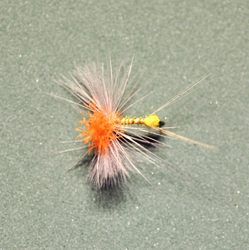 Spinners fall in the morning hours. Best activity occurs on cloudy & humid days. Medium to fast water sections of the Henry’s Fork, Madison, Yellowstone and other surrounding waters. 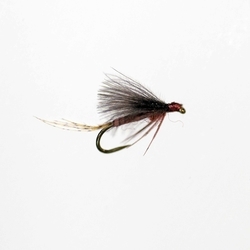 Especially common on the Last Chance section of the Henry’s Fork and the tailwater section between Ashton and Saint Anthony. Flavs closely resemble their larger cousin, the Western Green Drake. They are classified as crawler nymphs. Hatches are sometimes sporadic and undependable. 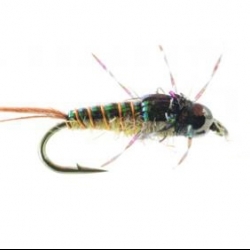 However, trout really love these robust mayflies and it doesn’t take many to create a feeding frenzy. 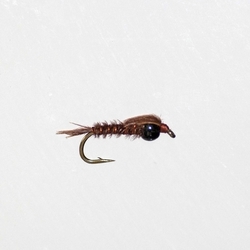 The duns emerge slowly on the surface making emergers and cripples top pattern choices.